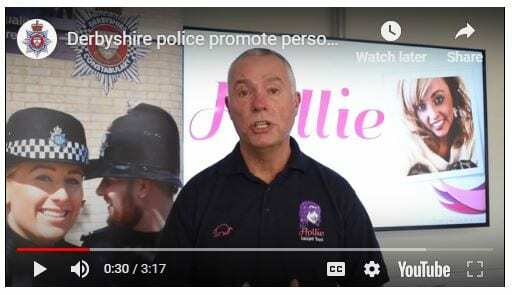 Officers are encouraging people across Derbyshire to download the Hollie Guard app to their smartphones to help them feel safe in vulnerable situations – particularly during the upcoming party season. In just over 12 hours after launching their social media campaign to promote the app (at the time of writing this) the video has been shared over 4,000 times and gained nearly 130,000 views. This is increasing too. Importantly, overnight alone there have been 200+ new downloads of the free app, as the total number of downloads marches towards 23,000. This is a huge boost for Hollie Guard, which is a free app that can be used in so many situations for people to feel safe. As always, we hope that no-one has to use the safety features on the app, but it can be used for peace of mind for victims of stalking or domestic abuse. The app is also useful for anyone who is safety conscious, we have many downloads from people who use it when going out running in the evenings, travelling alone to/from work and parents downloading it on to their kids smartphones for safe travel to and from school. We are absolutely delighted to be working with Derbyshire Police, adding to the other Police Forces we already partner with. We would love to work with more Police organisations up and down the country.